Six-speed electronic gear control gearbox which offers a choice between the comfort of automated operation or the pleasure of manual gear changing. - manual mode for sequential changing of the gears by the driver using the gear lever or steering mounted control paddles. 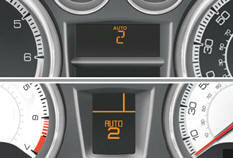 With each of these two modes, a Sport function is available for a more dynamic style of driving. With the automated mode, you can temporarily take control of gear changing at any time. - creep * (movement of the vehicle on releasing the brake pedal) in automated mode or reverse. * Model fitted with the 1.6 litre e-HDi PEF 112 hp Diesel engine. With your foot on the brake, move the lever upwards to select this position. Move the lever downwards to select this mode. M + / -. Sequential mode with manual changing of the gears. - or pull the lever rearwards to change down a gear. Press this button to activate or deactivate this function. +. Change up control paddle to the right of the steering wheel. Press the back of the "+" steering wheel control paddle to change up a gear. -. Change down control paddle to the left of the steering wheel. Press the back of the "-" steering wheel control paddle to change down a gear. 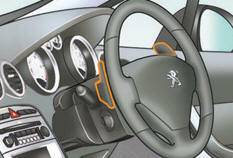 The steering wheel control paddles do not permit the selection of neutral or engaging or disengaging reverse gear. AUTO. This comes on when the automated mode is selected. It switches off on changing to manual mode. An audible signal is heard when reverse gear is engaged. Press the brake pedal down fully. N appears in the instrument panel screen. Select automated mode (position A ), manual mode (position M ) or reverse (position R ). Progressively release the brake pedal. Vehicles with the 1.6 litre e-HDi PEF 112 hp Diesel engine then start to move. AUTO and 1 , 1 or R appear in the instrument panel screen. N fl ashes in the instrument panel, accompanied by an audible signal and a message in the screen, if the gear lever is not in position N on starting. The Foot on the brake pedal warning lamp comes on, accompanied by an audible signal and a message, if the brake pedal is not pressed on starting the engine. AUTO and the gear engaged appear in the instrument panel screen. You can temporarily take over control of gear changing using the steering mounted "+" and "-" control paddles: if the engine speed allows, the request to change gear is accepted. AUTO and the gear engaged is displayed in the instrument panel. This function allows you to anticipate from A to M or from M to A .
certain situations such as overtaking another vehicle or approaching a bend. After a few moments without any action on the control paddles, the gearbox starts managing gear changes automatically again. The gears engaged appear in succession in the instrument panel screen. When braking or slowing down, the gearbox changes down automatically so that the vehicle picks up in the correct gear. On sharp acceleration, the gearbox will not change up unless the driver acts on the gear lever or the steering mounted control paddles. Never select neutral N when the vehicle is moving. It is possible to change mode at any time, by moving the gear lever from A to M or from M to A . Following selection of the manual mode or automated mode, press button S to activate the Sport function which offers you a more dynamic style of driving. S appears next to the gear engaged in the instrument panel screen. Press button S again to deactivate the function. S is then cleared from the instrument panel screen. The Sport function is deactivated each time the ignition is switched off. To engage reverse, the vehicle must be stationary, with your foot on the brake pedal. At very low speed, if reverse gear is requested, this will only be taken into account when the vehicle is immobilised. The Foot on the brake pedal warning lamp comes on in the instrument panel to encourage you to brake. At high speed, if reverse gear is requested, the N indicator lamp will fl ash and the gearbox will change to neutral automatically. To engage a gear again, return the lever to position A or M .
This function allows temporary immobilisation of your vehicle. It maintains the pressure of the brakes briefl y, long enough for you to move your foot from the brake pedal to the accelerator pedal. - on a descending gradient, with the vehicle stationary, gear lever in position R , the vehicle is held briefly when the brake pedal is released. Do not hold the vehicle using the accelerator: use the foot brake or the parking brake. Never leave the vehicle during a hill start assist phase. This function makes manoeuvring the vehicle much easier at low speeds (when parking, in traffic jams…). After first placing the gear lever in position A , M or R , the vehicle starts moving as soon as you take your foot off the brake pedal. When the engine is idling, brakes released, if position A , M or R is selected, the vehicle moves even if you do not press the accelerator. Never leave unsupervised children in the vehicle with the engine running. - leave the gear engaged; in this case the vehicle cannot be moved. In both cases, it is essential that you apply the parking brake to immobilise the vehicle. When immobilising the vehicle, with the engine running, you must place the gear lever in neutral N .
With the ignition on, if this warning lamp comes on and AUTO fl ashes, accompanied by an audible signal and a message in the screen, this indicates a malfunction of the gearbox. This warning lamp may also come on if a door is opened. With the ignition on, if the warning lamp above and this warning lamp come on, accompanied by an audible signal and a message in the screen, this indicates a malfunction of the hill start assist system. It is essential to press the brake pedal when starting the engine. When parking, is it essential to apply the parking brake to immobilise the vehicle, whatever the circumstances.